Get an instant alert if your Laravel scheduled cron job fails to run. Scheduled cron jobs often form the backbone of a Laravel application, usually carrying out critical tasks on behalf of your customers. Yet, often these jobs are hard to monitor as they run in the background. No system is 100% resilient and downtime is inevitable. If these jobs stop working for any reason, you may lose data and even customers. 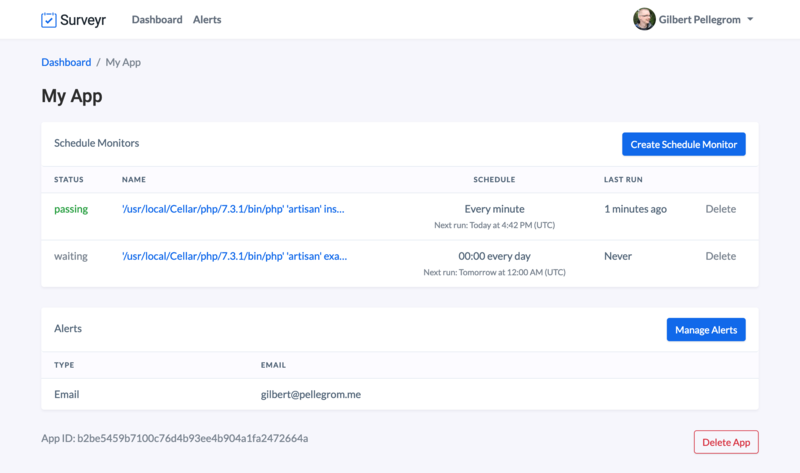 Surveyr saves you time and money by monitoring your scheduled jobs in Laravel and sending you alerts if a job stops working for whatever reason. This means you can stop worrying about cron jobs and focus your energy on building your Laravel app and growing your business. Buffer managed to generate $4 million per year from a single cron job. Imagine the impact it would have on their business if it stopped working! Use our Laravel package to quickly import your schedule monitors into Surveyr and handle sending pings to Surveyr. Get up and running in minutes not hours. Get alerted as soon as a problem occurs so you can diagnose and resolve it as quickly. Configure email alerts, Slack alerts or both. See exactly what your scheduled cron jobs are outputting to keep an eye on performance or to help debug issues when they arise. Once your schedule monitor has been successfully set up and pinged for the first time, we send you a confirmation email to let you know we're monitoring it. Surveyr supports any cron schedule including up-to-the-minute monitoring. We even display human readable versions of cron schedules to make your life easier. Invite your team members so that they can manage their own apps and schedule monitors under a single team account and have access to the correct information when they need it. Try Surveyr for free. No card required. Money back guarantee. If for any reason you are not happy with our product or service, simply let us know within 30 days of the end of your free trial and we'll refund 100% of your money. No questions asked. What is a schedule monitor? A schedule monitor is a monitor for a single scheduled cron job. For example, in Laravel each $schedule->command() you have will require an individual schedule monitor. What happens when my 10 day free trial ends? When your free trial ends you will need to sign up for a subscription via the billing page. If you don't upgrade to a paid plan at this point your schedule cron jobs will no longer be monitored. What happens if I go over my schedule monitor limit? When you reach the limit of schedule monitors for your plan you will no longer be able to create new schedule monitors. To create new schedule monitors you will need to upgrade to a higher plan. Will your package slow down or break my app? Our Laravel package is designed to put minimal extra load on your scheduled jobs and will not affect your jobs even if pings to our service fail. You can upgrade your plan at any time via the billing page. Upgrades will be prorated and you won't be charged until the beginning of the next billing cycle. You can cancel your subscripiton at any time via the billing page. When the current billing cycle ends your schedule cron jobs will no longer be monitored and your card will stop being billed. Interested in getting Surveyr news and updates? Sign up to our newsletter using the form below.